One of the biggest Hindu festivals, Rama Navami will be celebrated this weekend. There’s a slight confusion over Rama Navami 2019 date in India because of Ashtami (eighth) and Navami (ninth) day of Chaitra Navratri. Shri Rama, the seventh incarnation of Lord Vishnu was born on Navami Tithi during Shukla Paksha of Chaitra month. Rama Navami 2019 date and time in India will fall on April 13 as per the Hindu calendar, however, Vaishnava Rama Navami will be celebrated on April 14. We will read in detail about the Rama Navami puja shubh muhurat, puja vidhi, significance and its lavish celebration in the country. Happy Ram Navami 2019 Wishes: WhatsApp Stickers, SMS, GIF Image Messages, Facebook Photos & Quotes to Send Greetings on the Auspicious Hindu Festival. Rama Navami is a part of Chaitra Navratri, also known as Vasant Navratri (Spring Navratri). It falls on the ninth day of the bright half (Shukla Paksha) in the Hindu calendar month of Chaitra. In 2019, as per Drik Panchang Navami, Tithi begins from 11:41 am on April 13 and Navami Tithi ends at 9:35 am on April 14. People will be celebrating Rama Navami on April 13 (Saturday) but followers of Vaishnava Calendar will celebrate Sri Rama Navami on April 14 (Sunday). Chaitra Navratri 2019 Full Dates & Hindu Calendar: Ghatasthapana Puja Shubh Muhurat Time & Significance of Nine-Day Navaratri Festival. As mentioned above, according to Drik Panchang, Navami Tithi begins from 11:41 am on April 13 and Navami Tithi ends at 9:35 am on April 14. And, Rama Navami Puja Shubh Muhurt is from 11:25 am to 13:54 pm on April 13 (Saturday). Rama Navami Madhyahna Moment is at 12:39 pm. Now, Madhyahna period is the middle of Hindu day. It is believed Lord Rama was born during this time. Madhyahna which prevails for six Ghatis (approximately 2 hours and 24 minutes) is the most auspicious time to perform Rama Navami Puja rituals. The mid-point of Madhyahna marks the moment when Shri Rama was born, and temples symbolise this moment as the birth moment of Lord Rama. During Rama Navami 2019, devotees will have a duration of two hours 28 minutes to perform puja rituals. Ram Navami 2019: Did You Know Lord Rama Had a Sister? 10 Interesting Facts about Sri Ram. Shri Rama is one of the most revered deities in Hinduism. And, Rama Navami marks his birth anniversary. Rama, the seventh avatar of Lord Vishnu, was born to King Dasharatha and Queen Kausalya in the ‘Treta Yuga’. The highlight of this era was Rama’s birth to save the world from the tyranny of demon King Ravana who have all the three worlds the Earth (Prithvi), the Heaven (Swarg) and the Netherworld (Patala) under his control. Rama was a great king under whose leadership everyone lived a happy and dignified life. 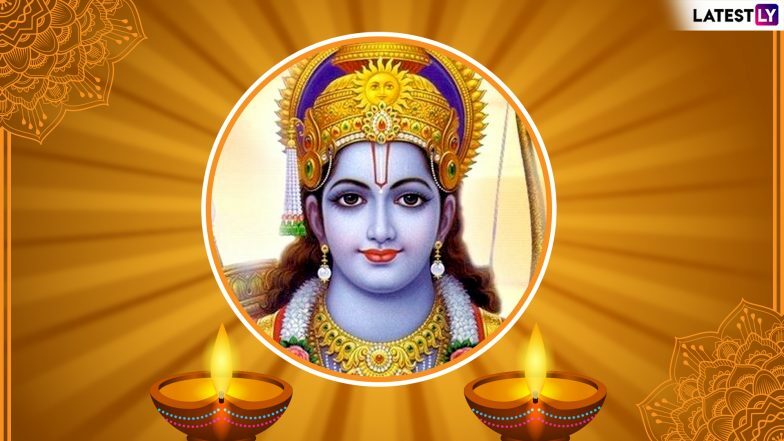 Rama Navami 2019 Date: Know Everything About Vrat Katha, the Story of Lord Ram. Devotees get up early in the morning and take a holy bath. They dress up in clean, not necessarily new clothes. They observe fast for the day (in Vaishnava Rama Navami, fasting till sunset is done) and worship Lord Rama. A photo or idol of Lord Rama is worshipped, by applying vermillion on it, offering flower garland, tulsi leaves, and lotus flower. Prasad preferably kheer is offered to Shri Rama. Devotees chant the name of Lord Rama and also visit temples on the auspicious day.